Kent PCC elections: the results in detail. This post is strictly for politics nerds. Yesterday we looked at the result of the Police and Crime Commissioner and today I want to look at the results in some more detail. 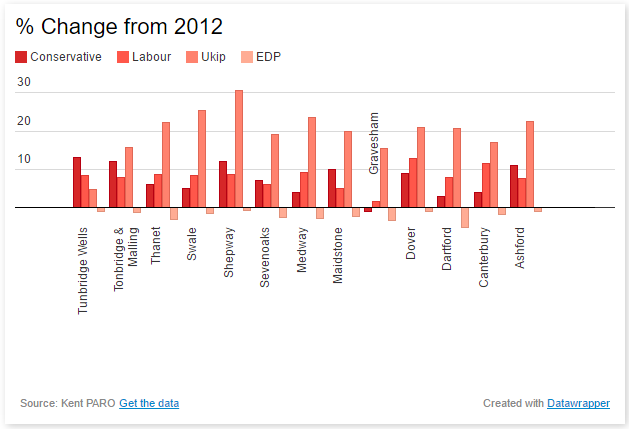 All of the major parties have increased their vote share in every district (except the Tories in Gravesham). That’s unsurprising: all of Ann Barnes’s votes from 2012 were up for grabs. The English Democrats’ Steve Uncles saw his vote share fall everywhere: remarkably, on a much-improved turnout his votes went down in every district too. He did particularly badly in Dartford, the district he lives in. I’m not going to pay him too much more attention, except to observe that, on the day London elected its first Muslim Mayor, race-baiting seems to be the fast-track to political oblivion. 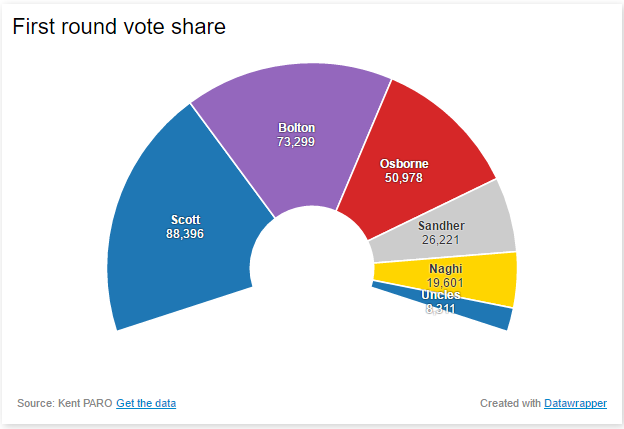 Though the Tories won, Ukip will doubtless be pleased with these results. There are some impressive increases in vote share: particularly in Shepway, where it seems to be building up something of a power base. Labour really ought to have done better, though these results are far from disastrous for them: the fact that they didn’t do so is probably more to do with their lacklustre national performance than their local campaign. There’s little here to remind us, however, that there used to be a handful of Labour MPs in Kent: these are just the sorts of seats they need to win back if they are to have any hope of forming another Government. Finally, the Lib Dems have slipped further into irrelevance. Update: The Political Medway has a very comprehensive analysis of the results which is well worth a look. Previous Previous post: Kent PCC elections: the people have spoken. Well, some of them. Next Next post: England and Wales PCC Elections – the full results.